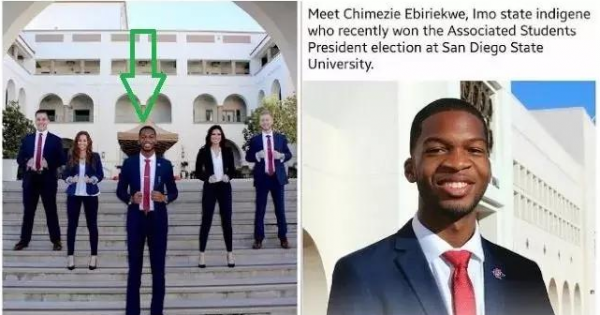 A Nigerian from Imo State, Chimezie Ebiriekwe, has emerged the winner in the Associated Students presidential election. He polled 3,454 votes in the election, which is similar to the SUG elections in Nigerian universities, to defeat his closest opponent Ben Delbick, who got 1,189; Chloe Sension (1,014) and Kaitlyn Hart (94). 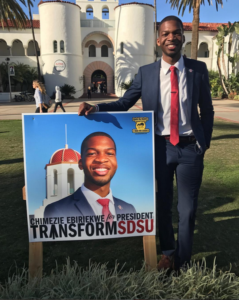 A brief profile of the Business Marketing Major on the school’s website reads, “My name is Chimezie Ebiriekwe I am from Carson, CA, I currently attend San Diego State University and I graduated from Crenshaw High School. I went to school in a neighbourhood where every black male either does not graduate from high school, or they do not make it past their first year in college. I made it out of high school, but I do not want to be the statistic that does not make it out of college. The only class that is geared towards my intended major is my MIS 180: Information Systems class, and the class is the best class I have on my schedule right now. As a Freshman I believe that I am very involved on campus, I currently hold an Executive Board position as Treasurer for the Afrikan Student Union (ASU) and I am on the Marketing Committee for the American Marketing Association.